Eagle Superabrasives, Inc. is fully capable of providing you with just about any wheel that your facility may need. Our current maximum diameter is 700mm (27.5”) and with abrasive sections up to 300mm (12”) wide, you can be sure we can provide what you need without the need for calling multiple suppliers and being given the runaround or false promises. We can literally produce ANYTHING smaller in Resin Bond, Metal bond and Vitrified bond. Continuous rim – no problem. 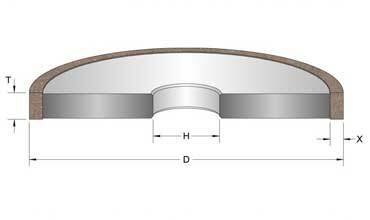 Segmented rim – no problem. Aluminum Core, Steel core, Composite core, Abrasive core – No problem. 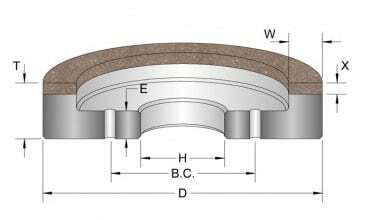 Need ultrathin cut of wheels? We can produce down to 0.004” in resin bond and metal bond – No problem. Our state of the art CNC turning centers, CNC milling machine, CNC surface grinders and CAD generated 3D drawings will provide you with the accuracy, repeatability and reliability needed in a wheel supplier. We get it right every time – guaranteed or your money back, no matter the complexity or the accuracy required.